I’ve decided to give up Twitter and IRC for 40 days and 40 nights. This is quite a big deal for me. It remains to be seen how well it works, but I’ve survived the first couple of days. @harry_wood has gone quiet! I’m anticipating some possible positive effects of giving it up for the next 40 days and 40 nights. Maybe I’ll blog more. 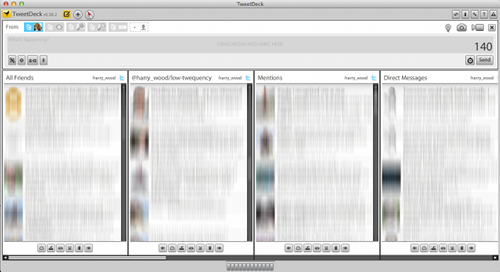 Somehow twitter uses up a lot of the creative energy that previously would have gone into writing blog posts. 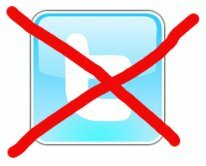 I know I’m not the only one to more or less stop blogging as I embraced twitter. There’s a few things I really should have blogged about but lately I’ve just been using my blog for publishing presentation slides. So more to come here hopefully. These days twitter replaces RSS for many people. It’s normal to tweet with a link to your blog every time you post. Should I allow myself this? I think not. I’m going cold-turkey on this one! Who knows, maybe somebody else might tweet a link to here. Or maybe nobody will read this 🙁 As usual, if you say “hi” in the comments it will make me happy. If you don’t, then I’ll just brood about whether or not I have a signficant number of lurkers. The other positive effect will be eliminating the time sink that twitter represents. Although twitter is a neat way to distil things and the signal to noise ratio isn’t too bad (otherwise I wouldn’t use it) I can’t deny that it is often just a tempting distraction. One click of that juicey looking tweetdeck icon and I can marvel with a dizzying feeling as technology and society and all manner of fun seredipidous nonsense spins before my eyes, and… oh yes I was supposed to be doing some work. I’ll be quitting IRC too (Chatrooms for those who don’t know) The mac Adium IRC client lets me auto-join all my favourite OpenStreetMap channels, and then the cute little green duck flaps its wings when someone wants to chat to me. How can I not click on a cute flapping green duck?? I won’t go completely cold turkey on this, because I have some meetings I need to attend, but over lent the duck will die. I imagine I may move onto facebook and google+ to get my fix of realtime updates. I’ll allow myself this because I see it as another positive. I feel I should try to understand google+ better. After the failure ot orkut, buzz, and wave, it seems google are going to shove this one down our throats via their search results, so perhaps there will be no escaping how important it will be for promoting things. Meanwhile facebook is where all my non-techy friends hang out. I should stay in touch with them better. Also it’s easy to forget that facebook is much more mainstream than twitter, so promoting on facebook has more potential reach, if you can get your message right (and non-techy enough). It can well be argued that twitter is a terrible echo-chambre. A community of people all re-tweeting eachother, stroking eachother’s egos, whilst forgetting that there’s a big world out there beyond. I don’t really think that, twitter friends, but I sometimes wonder. Well for 40 days and nights I am severing my connection to the hive. Wish me luck! Oh and if you’re wondering how to reach me, drop me an email. Yeah one of those old things. If you limit it to 140 characters I’ll probably find that comforting in some way.